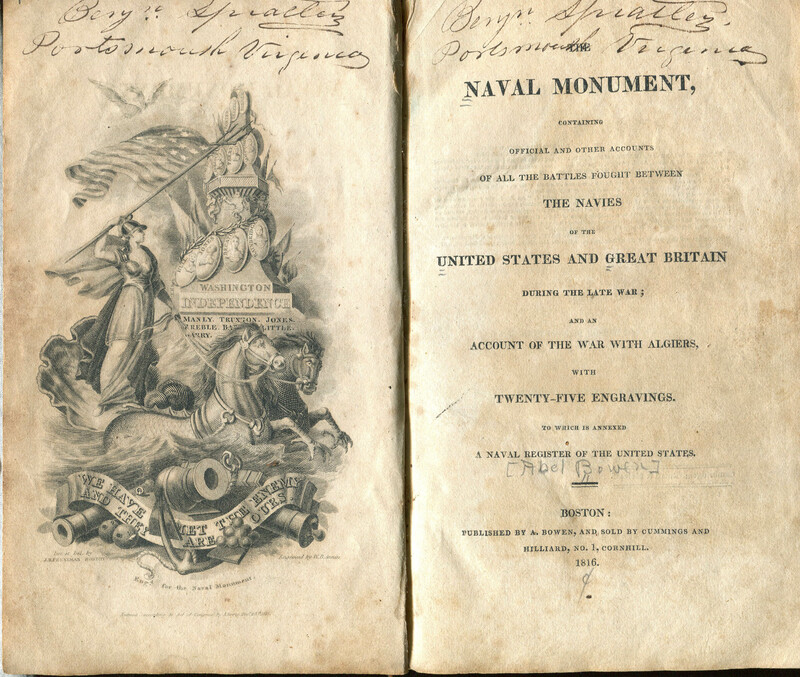 The Naval Monument, containing official and other accounts of all the battles fought between the Navies of the United States and Great Britain was written by Abel Bowen and published by George Clark in 1836 in Boston, Massachusetts. 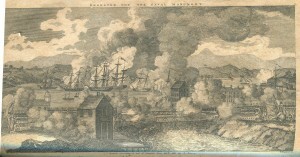 This work is a direct account for all reports between the United States and Great Britain navy during the War of 1812. Its written by a publisher, engraver and author named Abel Bowen who lacks the military experience one would need to write a military work. As I read these accounts, a question continued to arise in my mind, how could an author publish and write a work of which he had no previous experience in the field? It made little sense to me but being that the work had little to no narrative made me understand the circumstances more. In the beginning of the work, we are given a preface that in my opinion was an unrealistic view into the lives of the soldiers in the Navy. 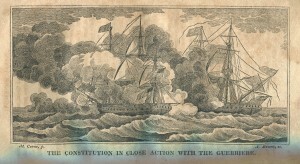 Bowen portrays the Navy in a very idealistic way, which differed greatly from the rest of the text. 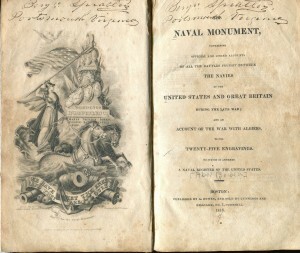 Following the preface the naval monument begins with direct accounts between officers in both the United States and Great Britain navies. These accounts include conversations about different tactics that the naval army would participate in, live accounts of battles with the British and conversations between captains. These reports gave the audience a chance to truly connect with the soldiers who were in battle. In addition to the United States accounts, the book contains some reports from the British naval force. These British reports differ greatly from the US reports in that they were increasingly emotional and formal. The US accounts were more realistic and genuine, giving its audience a first person perspective. The book itself was very fragile and brittle when I first looked at it in the Watkinson. The cover of the book was a simple brown face with no text on it, the spine of the book looked like the spine of an encyclopedia. 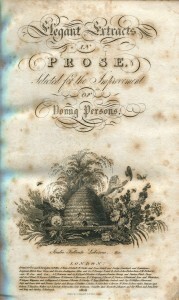 Covered with fine gold designs and text that stated the title and publication date of the work. The pages of the book were damaged and stained to a point where some were falling out of the book, causing me to read it with great care. 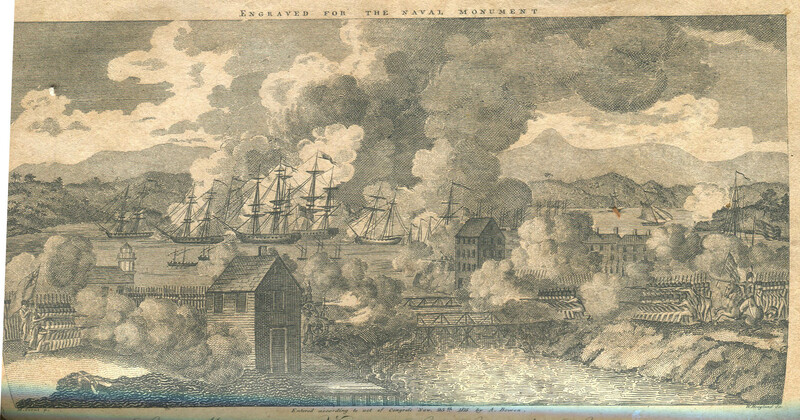 Inside the book contained many pictures of the various boats used in naval battles during 1812-1815. It was interesting to see a visual of some of the boats and scenes of battles in this work. This book became of particular interest to me because I was drawn to the detailed description of the battles. I found it interesting that these accounts were recorded almost down to the minute. There were many instances where this work would take the reader from a scene on a boat involving gunfire to then figuring out how to resolve the situation. This text was enticing to read while also being able to get an inner look at naval life in war during 1812. 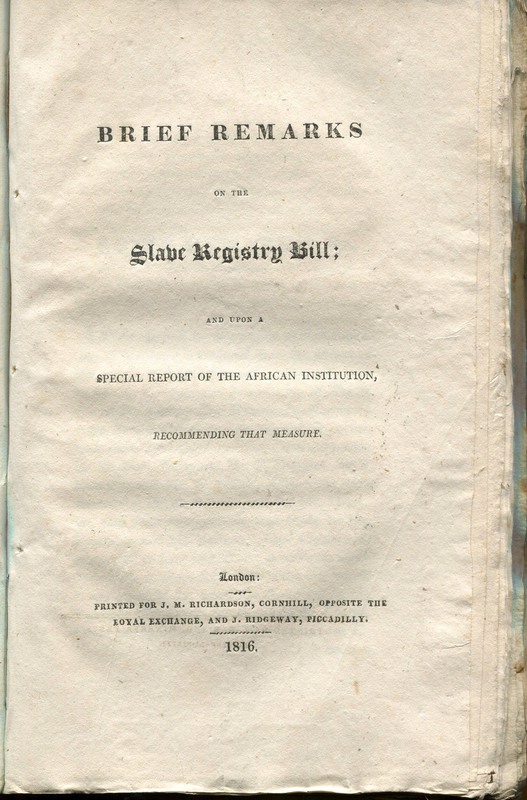 J. M. Richardson and J. Ridgway published Brief remarks on the slavery registry bill: and upon a report of the African Institution, recommending that measure, in 1816 in London, England. The item was published in a very large blue book with a spine that may have been white when first published, but is now a tan-brown color due to its age. There are other published items in the book, most of them discussing religious persecution of Protestants occurring at the time. The book containing these items, including the one I selected, is called a “pamphlet”. The pamphlet shows considerable wear indicative of its age; the top and bottom of the spine have broken off, exposing the bindings that hold all of the documents together. There is a title on the spine of the pamphlet, reading “Tracts on Protestant…” but the end of the title has faded and is incomprehensible. The book’s cover has fragile attachment to the pamphlet. 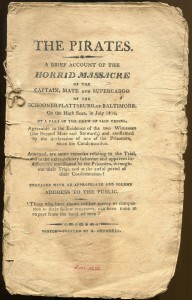 The edges of the pages inside the pamphlet are very frayed, appearing to be broken and chipped. While there are some stains, the pages themselves are in relatively good condition, even though it was clear that I needed care when navigating the book. There is no author specified for the piece, but it can be assumed that the author had access to the meeting of Parliament. 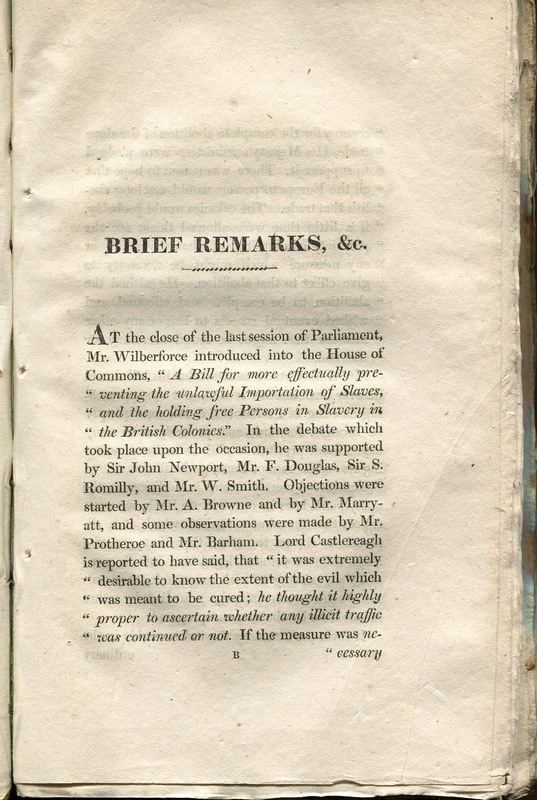 The document is about the introduction of a bill to the House of Commons that would prevent illegal trading of slaves in the British colonies. The bill was introduced by William Wilberforce, considered a leader of the movement to stop the trading of slaves in the British Empire. 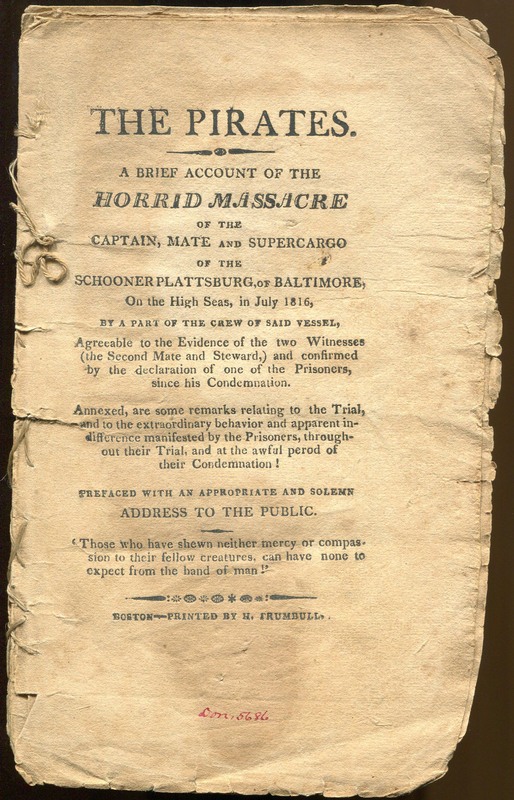 The bill was created as a measure to stop illegal slave trading in outside territories, particularly Jamaica. In 1807, Parliament passed the Slave Trade Act, which made the slave trade illegal throughout the British Empire. However, there was evidence that West Indian countries were still participating in the slave trade, hence the need for a slave registry. It is important to note that only the trading of slaves was deemed illegal in the Empire. Slavery itself would not be illegal until 1833, with the passing of the Slavery Abolition Act. Lord Castlereagh, also known as Robert Stewart, was Leader of the House of Commons and noted the significance the bill would have. He believed that the passing of the bill would ultimately lead to the abolition of the slave trade altogether, something that he supported wholeheartedly. 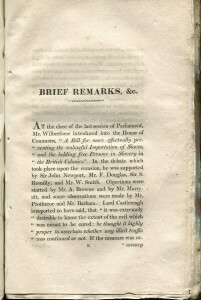 Lord Castlereagh also presented the opposition to the bill, coming from Jamaica. Their parliament believed that the new law proposed would violate and infringe on their constitutional rights. What drew me to this item was the chance to learn about how slavery was enacted, or abolished, in countries others than the United States, which my knowledge was primarily limited to. A lot of what I learned from the “brief remarks” came from the author’s own commentary on the bill. In his analysis of Lord Castlereagh’s comments, he said, “every prudent man would deprecate the unnecessary introduction of a question which separated this country the United States of America”. 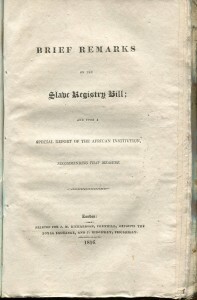 The author also expressed concern amongst the government that the British Empire could risk losing the West Indian colonies if they pushed more rules and regulations on them. The author seemed to believe that passing the bill without having sufficient enough evidence would be detrimental due to the backlash it would. The author note that, despite the general weakness of West Indian colonies in terms of military forces, it would be foolish of the government to underestimate their abilities to try to claim independence. Referencing the United States once again, the author poses the possibility of the United States attempting to gain control of Jamaica, in an effort to strengthen their naval power. Given the year of this item’s publication, I found the comment very indicative of the concerns Britain had over the stability of its empire. Forty years prior, the United States of America succeeded from the empire because they believed the empire was imposing intolerable rules and tariffs on them. The quote I reference in particular carries a hint of lingering ire regarding Britain’s loss in the American Revolution. It also speaks to the concerns of at least some that the war with United States was the beginning of a gradual decline in the Empire’s global power. It was a fear so strong that losing Caribbean colonies would be catastrophic enough to have Parliament reconsidering exerting its power over them. While the document itself is specifically about a single event, it goes to show how one piece of literature can be truly indicative of a country’s past, present, and future, as mine was. When I was looking over the very long list of publications from the year 1816, I was unsure of what book to study. I decided that Crystalina, A Fairy Tale seemed an interesting choice because I have always enjoyed fairytale stories. When I went to the Watkinson to examine the book, I was not sure of what to expect. I was handed a large book binding that contained an envelope with the actual book inside. Crystalina has a blue, cardboard binding which is as worn as its pages. I found it in a larger envelope because the front cover of the book is completely detached. Upon inspecting the pages of the book, Rick Ring informed me that the book is comprised of full and half sheets of paper. The half sheets indicate that Crystalina was not as expensive to print as a book printed entirely on full sheets of paper. 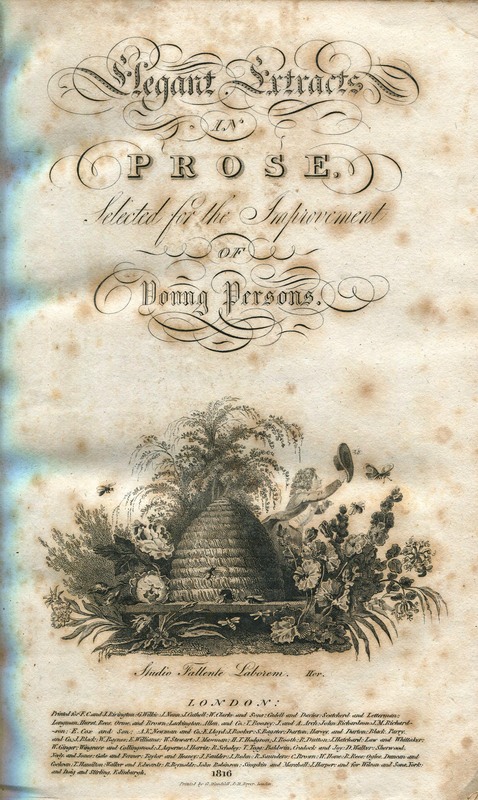 When I was examining the cover page, I discovered that Crystalina, A Fairy tale by an American, was published in New York by George F. Hopkins in 1816. I was surprised that the author of Crystalina, John Milton Harney, is not mentioned on the cover page. All that is mentioned about Harney on the title page is that he is American. 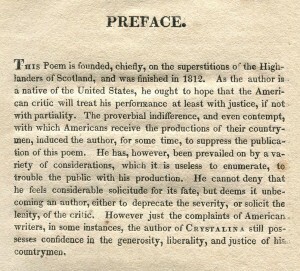 The preface of the narrative poem also mentions that John Milton Harney is a “native of the United States”. 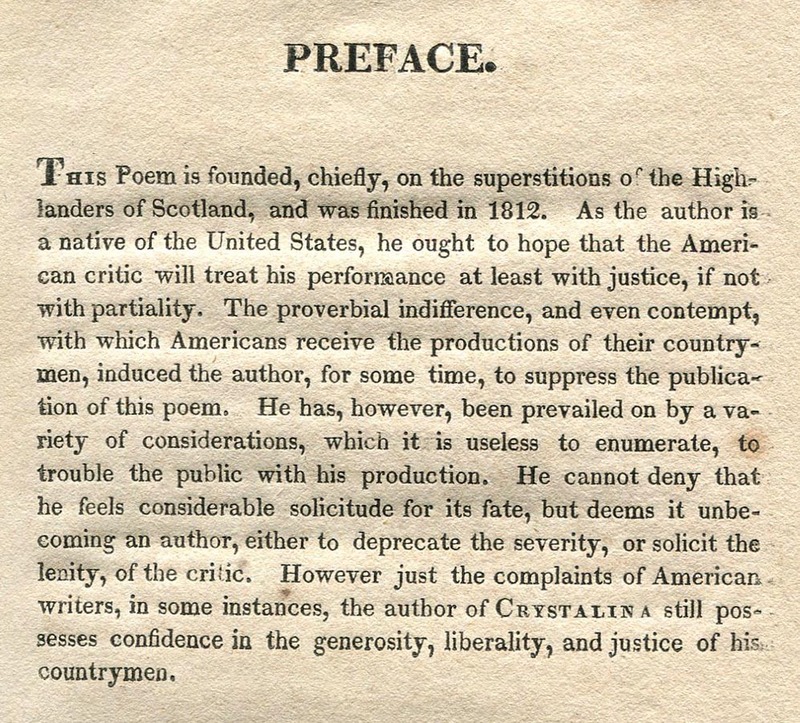 The preface is interesting because it informs the reader of the origins of the poem along with Harney’s apprehension in publishing Crystalina. It is written in third person, so it is unclear whether Harney wrote it himself. However, the reader may infer that Harney wrote the preface because it reveals his concerns that the American critic will receive his work with “proverbial indifference and even contempt”. 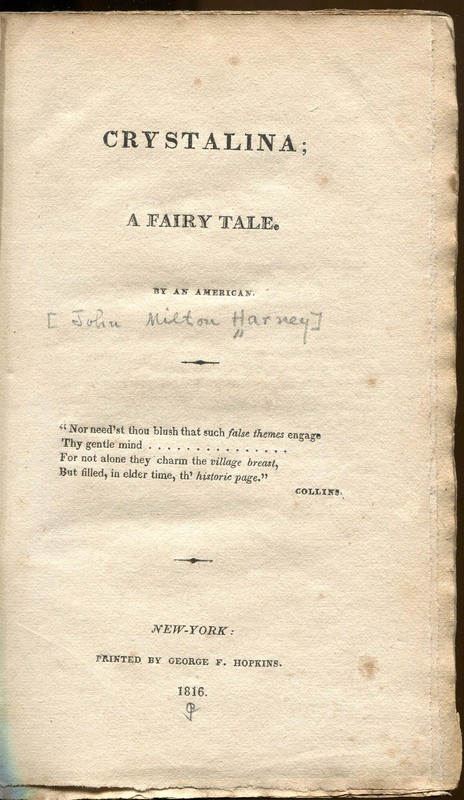 The reader learns that Harney completed Crystalina in 1812, but decided not to publish the poem until 1816. From reading the preface, it is clear that the uncertainty Harney feels in publishing Crystalina might be the reason why he is not specifically mentioned as the author in the published book. 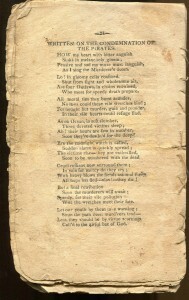 Harney finally published the poem placing faith in the “generosity, liberality, and justice of (Harney’s) fellow countrymen” that they might receive the poem well. The poem consists of six Cantos and as the preface states, it is “founded chiefly, on the superstitions of the highlanders of Scotland”. The plot of the poem is typical of a classic fairy tale story. The hero of the story is a gallant knight named Rinaldo who must prove himself worthy to marry the princess Crystalina. When Rinaldo proves himself worthy by fighting in battle, he returns to find Crystalina gone. In the first canto, Rinaldo ventures to find a seer who reveals that Crystalina has been abducted. The rest of the poem follows Rinaldo on his quest to find and save Crystalina. Crystalina is organized into lengthy stanzas and it is in iambic pentameter. 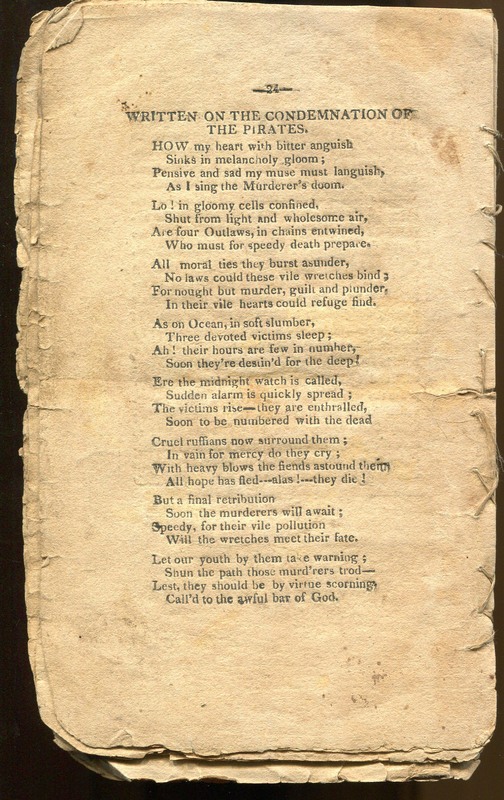 The first stanza of the poem has a rhyme scheme of ABAB, but the rest of the first canto has an AABBCC…rhyme scheme. The literary style of the first canto reminds me slightly of Milton’s epic poetry. Like much of Milton’s poetry, there are several references to mythological figures such as Orestes, and Rinaldo compares himself to Tantalus. There is also dialogue within the poem such as in the first canto when there is dialogue between the seer and Rinaldo. After the six cantos, there is a separate short poem entitled “The Ecstacy”. The poem has three shorter stanzas; in the first stanza, the speaker of the poem is imploring nature to prevent disaster and hardship. In the second and third stanzas, the speaker asks nature to bring joy and happiness. 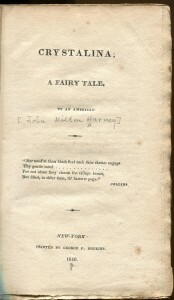 The final short poem “The Ecstacy” is certainly a fitting ending for Harney’s happily-ever-after fairytale. “Good Works” still applicable today! 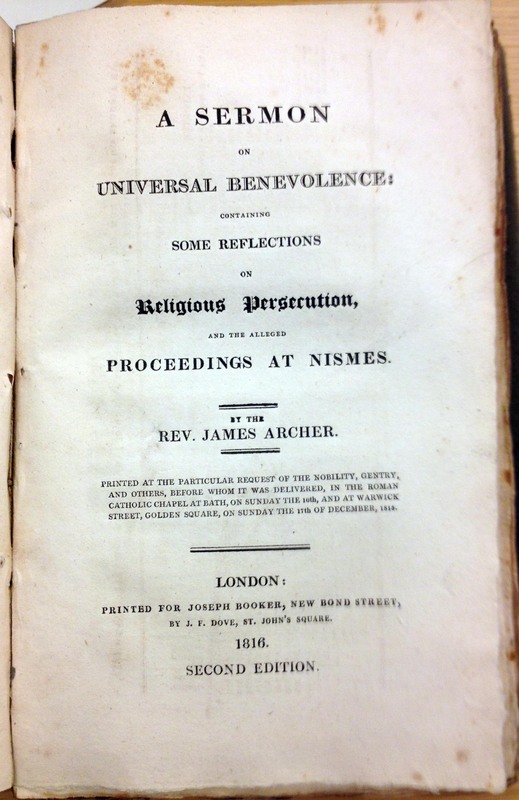 This piece is a sermon entitled “A Sermon on Universal Benevolence: Containing Some Reflections on Religious Persecution and the Alleged Proceedings at Nismes.” Reverend James Archer delivers this sermon. 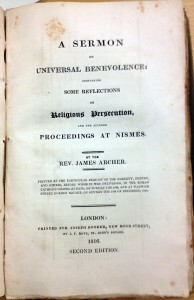 It is published in London in 1816 by Joseph Booker. This is the second edition. Reverend Archer’s sermon is published with a collection of other sermons as well as speeches and minutes, all having to do with Catholicism. Most pieces in this collection have been published within a few years of one another. The binding of the book, a collection of pamphlets, is extremely worn so all that can be made out is “Tracks on Catholic L.” The faded black cursive letters after the L are overlapping and difficult to make out. The spine of the book that holds together this collection is falling apart, so it must be handled with care. The ends of the pages are brown and worn. In this sermon Reverend Archer focuses on benevolence. He beings the sermon by stating that example is more powerful than reasoning and then argues that Jesus is that example. Jesus has fed the hungry and cured the sick, among other good deeds. Reverend Archer believes everyone should learn from Jesus and not only do good themselves but also teach others to do the same. Reverend Archer also makes the point that it is important to attend church. Not only does attending church signal a person supporting Jesus, but it also brings the community together. After preaching about what is right, Reverend Archer begins to discuss what is wrong. He is extremely adamant that violence is not the answer; violence is wrong. He believes violence contradicts what the Bible says. Therefore, he is very distressed about the ongoing tension between the Protestants and the Catholics. With God as the common denominator, there should be no serious issues between the two denominations, especially no violence. Reverend Archer then circles back to the beginning of his sermon and closes with saying that if a person does not do good in his life, he will spend his final days before death wishing that he did. Throughout the course of his sermon Reverend Archer quotes parts of the Bible in congruence with his argument. He also mentions a letter written by St. Augustine when is he speaking to the conflict between the Catholics and Protestants. When I first came across this piece I almost did not stop to read it; religious discourse can be quite tiresome. However, after only two pages I was completely interested. Reverend Archer seemed to have such an open mind about accepting all denominations under the larger umbrella of Christianity, which I liked. The subject of the sermon, being a good person, is also a great topic mostly because it is still applicable today. Though this document is well over a century old, there are still lessons to be learned from it today. I am curious firstly if Reverend Archer was ahead of his time in 1816 with these ideas and secondly if the other parts of this collection share similar ideas to these. Comments Off on “Good Works” still applicable today! You are currently browsing the I Found It at the Watkinson! blog archives for February, 2012.